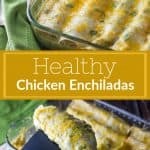 Before we get into how juicy and flavorful this low fat Chicken Enchiladas recipe is, before you go nuts over cheese drippings flavored with tomatillos, chilies, and cilantro, let’s chat about something that has nothing to do with enchiladas but everything to do with one of the most common cooking mistakes. Daannggg, I’m annoying. But lovable, right? I did not thoroughly read through the instructions beforehand. 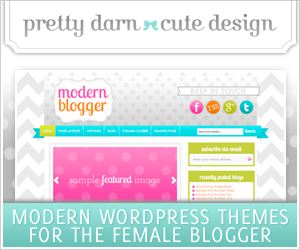 Okay, so I’m picky, snobby, bossy and, apparently, crazy. Who wants to be my friend??? This is why I keep them around. This recipe has been slightly adapted from Cooking Light magazine from way back in the primitive days (2001). It’s an oldie but a goodie! I had some chicken breasts in the fridge and the recipe said “chicken breast halves” so I figured I was good to go. But what I missed by skimming the instructions was “remove chicken from the bones“. Halfway through the cooking process I remembered making these chicken enchiladas before using chicken breasts with bones and how juicy and flavorful it made the meat. OOPPSS. Well, it turned out just fine without them, but the snob in me knows it could be better. 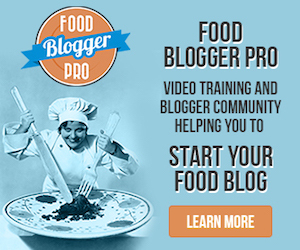 So if you do want to use chicken breasts without the bones, you can. But I’m telling you – the bones make the meat incredibly juicy and SO GOOD. If you’re picky, you get it. It’s all right if you’re picky and snobby. I’ll still be your friend. It’s okay to share that you have voices in your head, just don’t tell people you have hecklers, too. That’s where most people draw the line. Read your recipe in its entirety before shopping and cooking. It might help to read it out loud to avoid skimming it and missing something. People will think you’re talking to yourself but who cares? They already think you’re crazy. 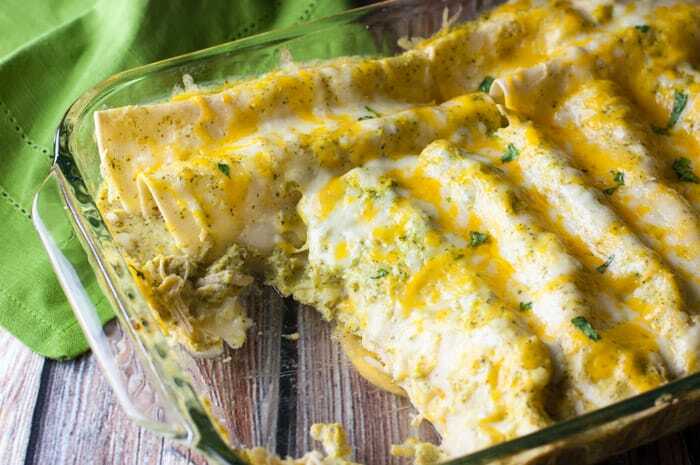 Make these chicken enchiladas so you’ll know how “cheese drippings flavored with tomatillos, chilies, and cilantro” can change your life. Enjoy! And if you’re feeling a little devilish, you can always use extra cheese (yes!) and you don’t have to make this with low-fat ingredients if you’re feeling like a rebel. What about you? What cooking mistakes have you made? Place first 6 ingredients in a Dutch oven (water through chicken) and bring to a boil. Once boiling, reduce heat, cover, and simmer for 45 minutes. Remove chicken from liquid and set aside to cool. Note: You can strain the liquid and reserve it in the fridge or freezer and use as chicken stock for other recipes. Preheat oven to 375°F. 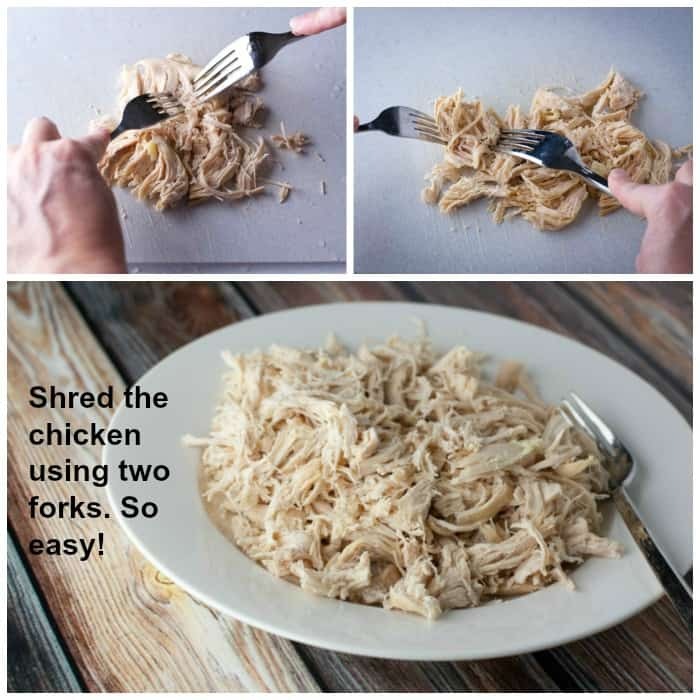 Shred chicken using 2 forks. In a medium bowl, combine 1/2 cup Monterey Jack cheese, 1/2 cup cheddar, and 1/3 cup of finely chopped onions. Set aside. Prepare the sauce by adding milk, cilantro, egg, 1/4 t. salt, tomatillos, and green chilies to a large food processor. Mix together until smooth. Leave in food processor for now and set aside. In a medium skillet, heat 1-inch of water until it simmers. 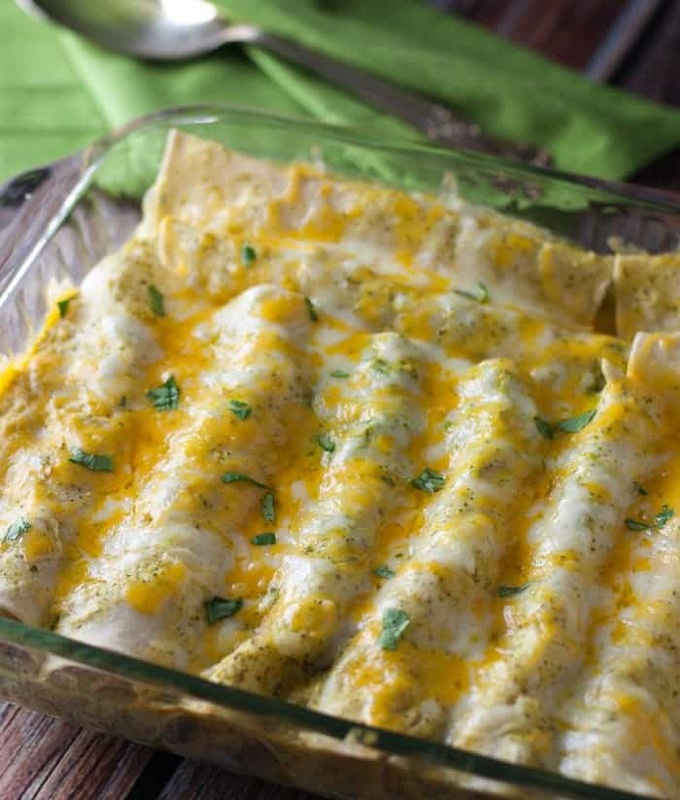 Put together those enchiladas! 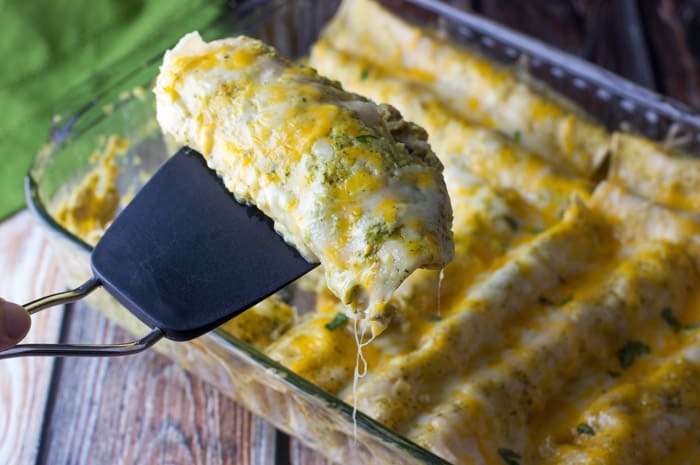 Make an assembly line starting with the tortillas, water in pan, bowl of cheesy chicken filling, a plate or cutting board to assemble them on, and a 11×7 baking dish (this holds about 10-12 enchiladas. If only making 8 enchiladas, you can use a slightly smaller dish). One at a time, dip tortillas in water using tongs. Submerge completely but only for a quick second. Put tortilla on flat surface. Spoon about 1/2 cup of filling in center of tortilla and roll tightly. Place in an 11×17 (or smaller if making only 8) baking dish. Repeat until filling is gone. 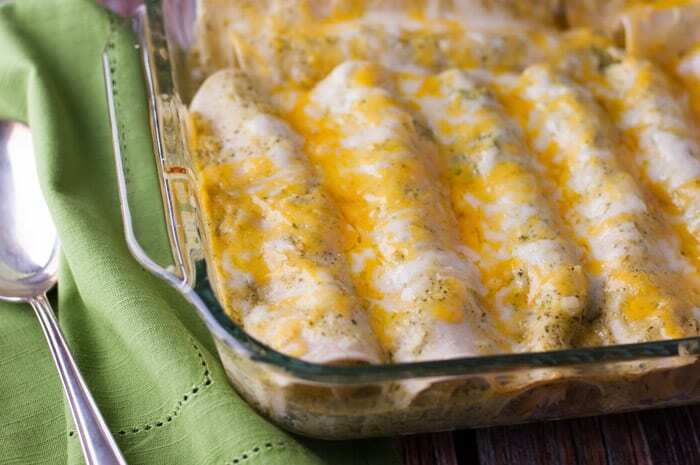 Give the sauce a quick mix in the food processor and pour sauce over enchiladas. Cover with tinfoil and bake at 375° for 20 minutes. 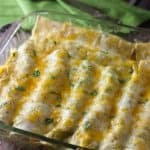 Remove from oven, uncover, and sprinkle the remaining 1/4 cup cheddar and 1/4 cup Monterey Jack cheese over the tops of enchiladas. Put back in the oven uncovered for 5-6 minutes, or until cheese is melted. This recipe doesn’t have to be made “low fat”. Just use milk and cheese you have on hand, if necessary. But it’s just as good with the low fat ingredients!